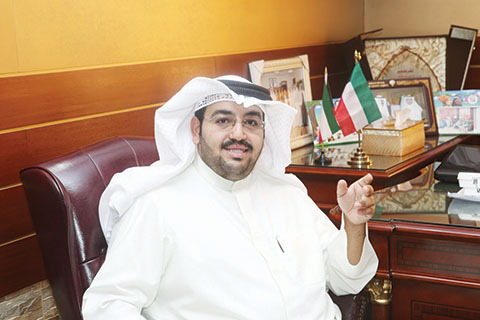 KUWAIT: Lawyer Ali Mohammed Al-Ali is running for the National Assembly elections as he believes he can bring positive changes to the country. Ali is the head of the legal committee of the Kuwait Society for the Ideal Family and a member of various NGOs. He has participated in a host of legal conferences that came up with many recommendations. A first-time candidate, he is running from the first constituency. Kuwait Times met Ali to learn about his preparations for the elections and the issues he will be focusing on. Kuwait Times: Why are you running in the elections and what do you want to change? Ali Al-Ali: We have noticed that laws and legislations are proposed by persons who are not specialists in the field. So a majority of legislations passed by the previous parliament were later canceled by the court, including the petrol price hike, electronic media, children’s rights, the DNA test and many others. KT: Why did the DNA law elicit such strong opposition from the public? Ali: We all are for applying the law to expose those who obtained Kuwaiti citizenship fraudulently by DNA tests, but on the other hand, we are against destroying families. According to this much-discussed law, a sample from both parents will be taken along with samples from the children. So if they find that a child is from a different father, it will be great problem, especially for the children if they are grown up. I propose to have the test done only from the mother’s side, and in this case we can find the forgers. All the cases of forgery that have been busted are of foreigners who were registered to the family to get citizenship, so they are not related to the mother. I have received anonymous letters from women asking me for help to find a solution for them and save them from great scandal that may even lead to their deaths, as their children are not from their husbands. Even HH the Amir has instructed to review this law and keep the test results secret, and only for the purpose of exposing forgers. KT: What else do you think should be changed? Ali: Today, there is a budget deficit. This was caused by the abortive development plan that didn’t provide an alternative. The parliament showed very weak performance and wasn’t productive at all. And due to not having alternatives and completely depending only on oil, the fall in crude prices caused this crisis that affected people living in this country. Also, many employees at various state institutions have complained that allowances paid to them have been stopped due to the budget deficit. We should have a rescue plan to solve this problem. We should realize the vision of HH the Amir of transforming Kuwait into a commercial and financial center. The previous parliament failed to achieve this, so we should have hope in the younger generation and give a chance to new and young people to bring about positive changes. The election and voting culture should be changed, since if we continue with the same system, no development will take place. Voters should be aware and work on bringing about change. I think about 50 percent of MPs may change. I believe that turnout will be higher too, and I want to advise those who are hesitating to vote that even if they don’t go, some candidates will win and become MPs anyway. So it’s better if they vote for a suitable person to represent them. KT: What is your plan or program for the elections? What are the issues that you will be focusing on? Ali: I will focus on changing the financial disclosure law for MPs, ministers and undersecretaries to submit their financial statements in order to avoid squandering of public funds. In addition, we want them to be paid fixed amounts by issuing a law that forbids them from receiving other amounts. If those who are in these positions are not sanctioned, it will lead to corruption. We want to approve more laws related to the youth. We have a huge number of young unemployed people who are waiting to get a job. We should benefit from their abilities and make them benefit from their free time. They can work in the private sector. We also want employees in the public sector to have a chance to take up a second job, as now they are not allowed to work in two places. If the government catches someone working in another place besides his main job, he will be terminated from his main job. I also want to focus on the disabled. Many of them are disabled but not listed as handicapped. Also, the allowance they receive is very low. The services available for them at public institutions are unsatisfactory, such as special elevators and others, as they need special care. The issue of children of Kuwaiti mothers from non-Kuwaiti fathers is another category that I have included in my agenda. The mother doesn’t receive rent allowance, while a Kuwaiti man gets a house, and before that receives rent allowance. Also, there are many other rights that men receive but women do not, including citizenship, inheritance and many others. Expats are one of the main pillars of this country, and we can’t live without them. So we also should work on reforms in their favor. We should care for their rights as well, as they do many main jobs here. Mainly, we should eliminate human trafficking including the so-called ‘iqama traders’ who bring in laborers on visas of ‘paper companies’ without ensuring jobs for them.